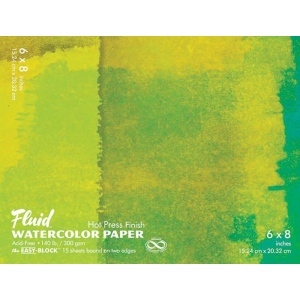 * Fluid Watercolor Paper is crafted in our European mill which produced its first paper stock in 1618. * Our mill masters craft small batches at slow speeds allowing for finer control of quality. * This slow approach produces a sheet of great strength that shares much of the working integrity of more expensive mould-made papers. * Selection That's a First for Watercolorists. 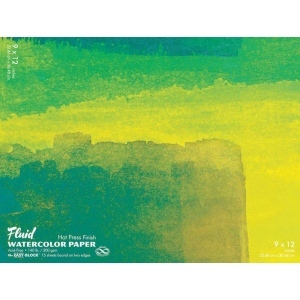 * Squares landscapes panoramas - never before has there been so much to choose from for watercolor painters. * 16 unique blocks offer convenience and inspire new directions in creativity. * EASY-BLOCK - 15 Sheets Glued on Two Edges. 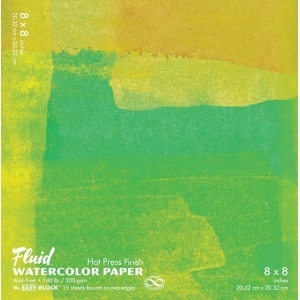 * Paint directly on the top sheet in the block. 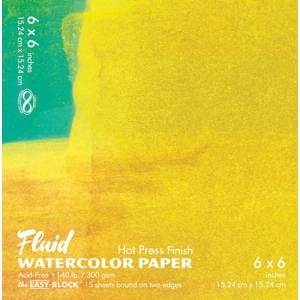 * The glue along the two long edges will hold the sheet flat as you paint. * When your painting is dry slide a dull knife or letter opener in the open side under the top sheet. * Release the glue along one edge and pull your painting free.